SOUTHPORT made a reasonable start to their second sojourn in Division III of the Football League. The first seven games yielded seven points and it could have been nine had they managed to capitalise on a 2-I interval lead at Wrexham. Nobody present would have predicted that the i—o win at Southend United was to be the last for three months. There were many contributory factors; reference has already been made to the manager’s preoccupation with recruiting older players. This was reinforced with the addition not only of George Ross (30) but also of Clive Clark (3o), Tony Coleman (27) and the return of Fred Molyneux (now 29). Injuries both serious and trivial played their part; Clive Clark broke his leg in the very first game at Cambridge and Frank Lee was carried off against Watford in January with what was subsequently diagnosed as a fracture. Clark reappeared fleetingly, Lee did not. In addition there was a marked breakdown of discipline on the field. The club accumulated an unprecedented fifty bookings over the season, not to mention the sendings-off of O’Neil, Russell and Molyneux. The campaign opened with Sibbald, Lloyd and Dunleavy under two-match suspensions and in due course both O’Neil and Russell served three-match bans for their sins. While such a catalogue cannot be defended, in other years the punishments might have been more easily absorbed. Finally, the control of the team was in a state of turmoil. Brian Green, seeing the writing on the wall, left in November for happier times at Chester; and on December 30th the board relieved Meadows of his post following two consecutive home defeats. The arguments raged about this course of action in view of his previous record but, in defence of the directors, something drastic was needed if the club were to survive in the higher division. The problem was that nobody was appointed to take the reins; Alan Ball returned to his old stamping ground as ‘honorary manager’ on a temporary basis but when by mid-February he was required for his managerial commitments back in Sweden it was left to coach Matt Woods to assume control. With all this disruption it is little wonder the team lost its way. The dearth of goals was the main problem. The 35 scored in League added to the 24 which had won him the award. Fryatt fared worse still; though he netted twice in the opening home fixture against Aldershot (a solitary 3-0 win) he registered just two more all season. After November 17th Southport only once managed to score twice in one match.. With a sound defence such a deficiency might be accommodated; but when the ever-improving Chris Dunleavy — still only 23 — was transferred to Chester for £12,000 early on, the stability of the championship side went with him. He was never adequately replaced. This is not to decry the efforts of all and sundry, however; Sibbald and Ryder maintained their continuity at full-back and did their job; Tommy O’Neil looked a useful acquisition from Manchester United as was later to be proved; and Alex Russell, who brought up his 300th League appearance in the March, could still turn on the magic from time to time. It was O’Neil though who provided the outstanding memory of the season. The penultimate visit of Tranmere Rovers for a League fixture in November coincided with the return of Clive Clark who put Southport 1—0 up early on. Later in the half, O’Neil picked up a loose ball deep in Southport territory and set off upfield; he rode one or two challenges, twice pushed the ball too far forward but regained it and capped his 75 yard sprint by firing a narrow-angle shot into the Tranmere net for an amazing goal. Shades of 1935 and Charlie Reed! Southport fell back on defence after half-time but still held their 2-0 lead until ten minutes from the end when Tranmere struck twice to force a draw. It was especially hard luck on 17-year-old Tony Sharrock whose impressive League baptism was marred when he failed to cut out Rovers’ equaliser. It was his one and only Football League appearance. A week later Southport were blown out of the F.A.Cup at a windswept Millmoor. Rotherham’s 2-I win was gained at the expense of an anxious club who needed a cup run too badly to be able to relax and do themselves justice. The surprise win at Charlton just before Christmas, courtesy of Tony Coleman’s 3o yard shot, ended the long bleak spell; it followed policy meetings between board and manager and the resultant harangue which Meadows gave the players for not being fighters. It was his final fling. 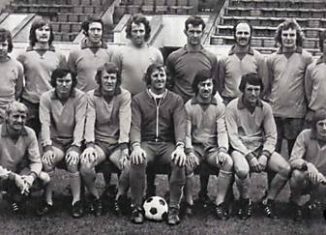 When the injury crisis began to bite in the New Year appeals were made to the League for permission to postpone the Plymouth Argyle game; initially the League refused and, with only nine fit men available, Southport hurriedly signed up Peter Scott from Everton and Ray Pritchard from Tranmere Rovers on loan. A month later the authorities relented and allowed the postponement of the scheduled match against Rochdale which would have been the first to be staged on a Sunday at Haig Avenue. It was the time of the miners’ strike and, with the three-day week, all efforts were being made to conserve manpower, energy and fuel. In the event Southport played five Sunday games between January 27th and March 17th. The first came at Halifax Town, while the first at home, on February 24th, resulted in only the second home win, 1—o over Bournemouth. Spirits were hardly raised by news of Peter Withe scoring on his First Division debut with Wolves or of Tony Field’s £75,000 transfer from Blackburn Rovers to Sheffield United. How Southport could have used the money these players should have realised! Too late came the encouraging defeat of leaders Bristol Rovers, though unsung heroes Mick Moore, Norrie Lloyd and Alan Taylor could take considerable credit for this upset. Yet a week later a crushing 6—0 Good Friday defeat at Boundary Park saw Southport condemned to relegation and Oldham Athletic confirmed as champions-elect. As consolation, the return game on the Easter Monday brought almost 10,000 to Haig Avenue for a League game for the last time. The final shock came with the retained list. Having taken stock of the jaded performances of Fryatt and Provan following their transatlantic excursion, the board had made it clear that any players choosing to spend the summer in the American leagues would not be retained. This automatically ruled out Fryatt, Provan, Clark, Ross and Wright but the retention of just Sibbald, Lee, Coleman, Hughes and O’Neil left a monumental rebuilding task for whoever took on the managerial role. In the event, everyone had to wait until the middle of June before the board could announce that Alan Ball would be the new manager, the delay being consequent upon the fulfilment of his coaching appointment with I.F.Saab in Sweden. The choice was by no means unanimous and the rift it caused led to the resignation of three directors, including the influential vice-chairman Leon Rapaport.